A spicy ham and jalapeño béarnaise sauce tops savory sausage dumplings in this totally original take on brunch. 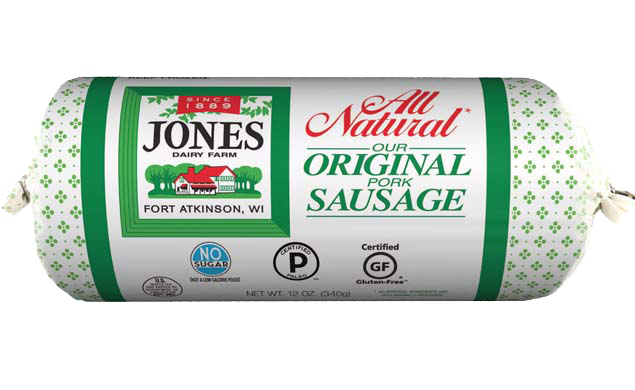 Over medium-high heat, cook sausage according to package directions, breaking into small pieces. Add jalapeno, onion, pepper and granulated garlic and cook for additional five minutes. Remove from pan and set aside. In same pan, add ham and cook according to package directions. Remove from heat. In small saucepan, add vinegar, wine, shallots and chopped garlic and bring to a boil over medium heat for one minute. Simmer liquid approximately 10 minutes until amount reduces to 2-3 tablespoons. Strain liquid directly into a blender. Add black pepper and 2 egg yolks. Melt butter in small saucepan over medium-high heat. Transfer to small measuring cup with spout. With blender running on low speed, slowly add hot butter to wine mixture. Add cooked ham and jalapeno. Pulsate mixture for approximately 30 seconds. Transfer to measuring cup with a spout, stir in chives and set aside. Lay out 12 wonton wrappers. Whisk egg whites. Add approximately 1 tablespoon of sausage mixture to each wonton, forming a small mound with a well in the center. Gently add one egg yolk to each wrapper. 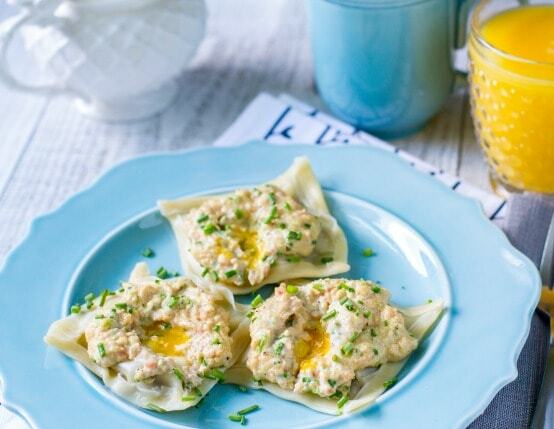 Wet sides of wontons with egg whites and top with additional wonton. Seal sides by pressing down firmly and folding edges in toward center. Let rest for 5 minutes. Add 2 to 4 sealed wontons to boiling water and cook until floating, approximately 2-3 minutes. Use slotted spoon to remove to plate; blot tops gently with paper towel. Repeat until all are cooked. To serve, reheat béarnaise sauce in microwave for 60 seconds. Plate three wontons and spoon sauce on to as desired. Top with additional chives.